To give a bit.... we (most of us) are not trying to make a living from buying and selling trains. There are people who do, and I don't begrudge them trying to make a living. But I have been around where a seller is trying to bottom dollar someone and resell it in the same show for more... can't blame a guy for trying, but I CAN blame people for being rude and indignant because they are selfish and greedy. Yes the dealer needs to make a profit and cover costs of holding stock, I’ve known many who do that honestly and I’ve sold to them but it’s the blaggers who spin you a load of crap trying to beat you way down I dislike, and I’ve met a few. Steve Warrington was an absolute gent when selling secondhand, he was up front about what he had to make and didn’t overinflate the subsequent sale price either. Another late friend who was a dealer was also well known for not cherry picking the best bits of collections and what he could sell them on for, he went as far as to give the widow of another friend an extra cheque when he realised the true value of some items he hadn’t had before. Both those guys were well respected and successful and pleasant company. The sad part is... It will eventually sell. One went on Ebay 6 months ago for half that. I wonder if it was the same one? I visited Steve a couple of times and had a couple of good Second Hand bargains from him, the most rewarding being an LGB Heidi which did many turns on the Ruschbahn. Was really great to have two of them running amongst all the other RHB Lecies and the Brawa 2-8-0. When I started work, £1,000 a year was a decent living wage. I began on £5 a week, less a bit of tax and National Insurance, at 33%. Today, that might get you a cup of coffee and half a bun. My first house cost £3,250. Today it would fetch about £140,000. Bachmann now want around $1500 for a loco, $100 for a boxcar. It’s the value of money that’s gone down, not the price of the goods going up. That said, I don’t think I’ve paid over £275 for any of my five larger locos, second-hand, obviously, apart from an Aristo just as they were shutting up shop, but I can't justify more than a couple of them at a time on the track anyway. Most layouts of whatever scale I see, and have seen over the years, have far too much stock going far too fast on far too little track. I’ve got about a (scale) 300 yard run. In reality, how many locos might you see in that distance, apart from inside an engine shed? Off the point, perhaps, but you see what I mean? 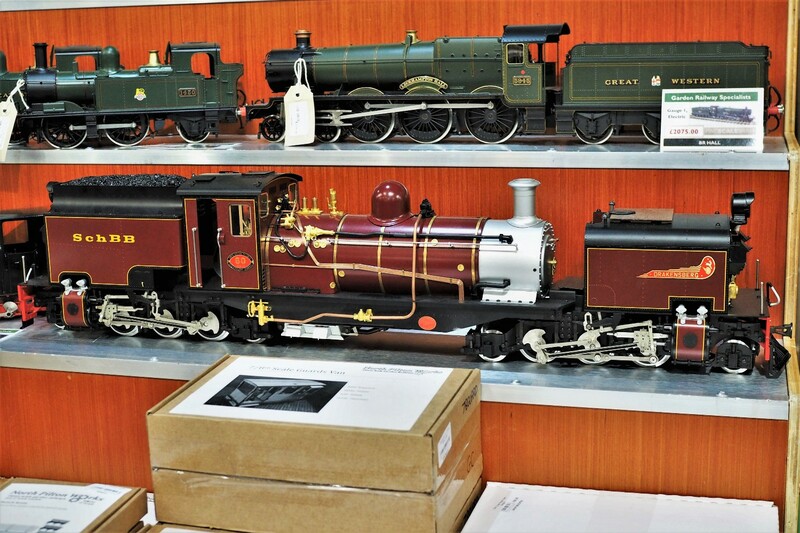 Well, I wasn't going to buy any more locos 'cos I didn't have the storage room in the shed. 'cos I didn't have the storage room in the shed. "You're gonna need a bigger shed!" - Cue music..
Cut to angry-looking SW approaching, as suggestion of bigger shed is mentioned.. - Oh, the drama, suspense, and jeopardy!